Ox Yoke Lodge was the second structure built here in the 1930’s; this rustic shelter was built of logs with the ceiling, roof and siding covered with cedar bark. The picturesque shelter, complete with a native stone fireplace and rustic furniture, housed many picnics and family functions. Hanging from the center roof pitch is a large ox yoke. This was a prominent feature when viewing the shelter and gave this structure its name. Herman would design his structures, but never write down a plan; it was always in his head. Our beloved lodge is growing more and more unstable every season, and we are looking to renovate and improve it! 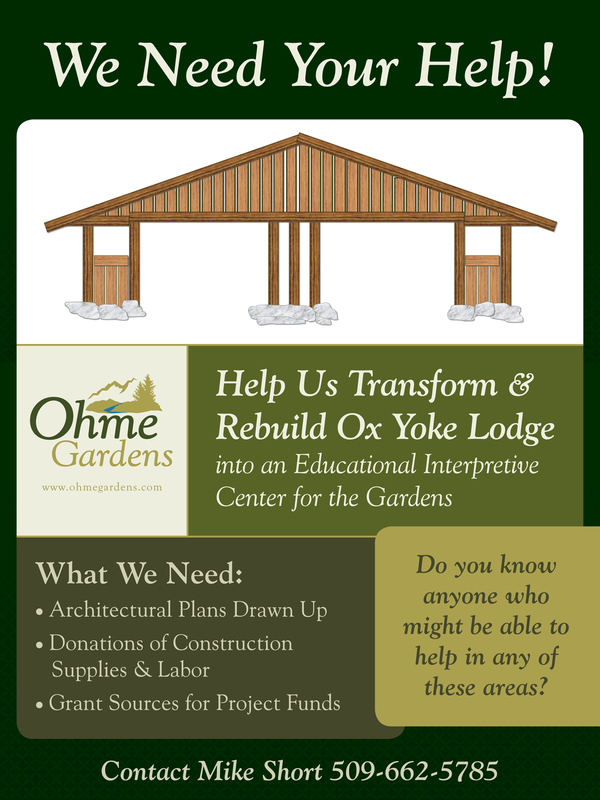 We are hoping some of our Ohme friends either have the knowledge or have a friend (who has a friend) that is a retired architect or grant writer. Either way, we need help to keep our beautiful historic garden alive and safe for future and returning visitors!